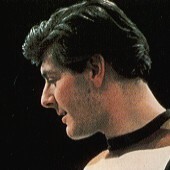 Born in 1939 Peter Purves become an actor first with the Barrow-in-Furness Repertory Company and then with the Wimbledon Theatre Company. His first appearance on television was in Z Cars. He was auditioned for the part of a Menoptera in the 1964 Doctor Who story "The Web Planet" but was turned down. He was later cast as an American Hillbilly in "The Chase" and this led him to play the part of Steven. After Doctor Who he became a presenter in the children's programme Blue Peter. More presenting work followed mainly in sports programmes and the annual dog show Crufts. Initially appearing simply as a space pilot from the future, Steven Taylor’s history was only elaborated on in later novel "Salvation". Having become a pilot to effect social change, Steven found himself flying a fighter based on modified Dalek designs in various wars between Earth, its colonies and other alien species, culminating in him witnessing another soldier beat a woman to death on the colony of Royalus Prime because she wouldn’t move fast enough. Having sacrificed his career due to his determination to see the soldier punished for his actions, Steven was reduced to flying pointless patrols in distant parts of the galaxy, culminating in him crash-landing on the planet Mechanus and had been imprisoned by The Mechanoids who are robots that were developed to prepare the planet for colonisation. Mistaking Steven for one of the colonists he has been kept in the city ever since. Steven however, is not aware of this, as the Mechanoids have no method of communicating, and so Steven felt that he was a prisoner. In trying to escape from the Daleks, who have been chasing them in a captured time capsule, The Doctor with Ian, Barbara and Vicki also find themselves on the planet Mechanus. They to are captured by the Mechanoids and find themselves placed in the same room as Steven. When the Mechanoid's city is attacked by the Daleks Steven escapes by following The Doctor and manages to board the TARDIS unnoticed ("The Chase"). After seeing Barbara and Ian depart in the Daleks' time capsule it was not until the next story that The Doctor and Vicki realise that Steven has stowed aboard the TARDIS. Like the companions before him Steven is obviously surprised and incredulous about the size of the inside of the TARDIS. It took him some time to come to terms with the fact that the blue box he had stumbled into could actually travel in time and space. Initially he certainly made life for The Doctor and Vicki very difficult when they landed in Northumbria in 1066. He became very obstinate and refused to believe The Doctor's claims that they had travelled in time as well as in space. This was his way of coming to terms with what was happening to him. Even after hearing Vicki's explanation and the use of the TARDIS' acronym 'Time And Relative Dimensions In Space' he replies with one of his own 'IDBI - I Don't Believe It' ("The Time Meddler"). Once over his initial incredibility Steven very quickly settles down to the life of being a space and time traveller, demonstrating a fascination with the possibilities and concepts presented by his new existence, such as contemplating the consequences of The Meddling Monk’s attempts to change history by altering the outcome of the Battle of Hastings. However, he never really felt in full control during his time in the TARDIS. Despite being an astronaut from the twenty-fifth century - as well as surviving at least two confrontations with the Daleks - he was mostly out of his depth. This was more pronounced in "The Celestial Toymaker", when he was separated from The Doctor and found that he could relate to very little within the Toymaker's realm, although he and fellow companion Dodo still came through in the end. For all his faults, Steven was a brave, dynamic and motivated character. He was always ready to leap into action and help when his friends found themselves in trouble. He was single minded, cynical and very brash who had a tendency to leap before he looked. Even so he was a very heroic companion and did look out for The Doctor, on one particular occasion risking his life to save The Doctor from the Daleks’ time destructor when it nearly aged The Doctor to death ("The Daleks’ Master Plan"). He also cared a lot for Vicki and later, Dodo, accompanying her in playing the Toymaker’s deadly games to recover the TARDIS and escape his realm ("The Celestial Toymaker"). Despite having moments of brilliance he was for the most part always struggling to keep up with The Doctor. Being a stubborn, argumentative and a very strong willed companion he did have frequent arguments with The Doctor. In one story, "The Massacre of St. Bartholomew's Eve", Steven even left The Doctor temporarily because he was disgusted with The Doctor's detached and alien response to the deaths they had recently witnessed, subsequently joining a group who worshipped a race of god-like beings in 1965 New York ("Salvation"). However, his time with this group ended when he learned their true nature as essentially blank slates, shaped by the desires and thoughts of those who witnessed them, and acknowledged that mankind was not mature enough to ‘control’ beings of such power at this time. Although Steven regretted and resented his inability to save everyone he met in the TARDIS - prompting him to briefly leave The Doctor after he refused to help save Steven’s new friend Anne Chaplet from the St Bartholomew’s Day Massacre - he found peace in the moments when he was able to make a difference, such as saving some honourable soldiers and young lovers from dangerous alien technology during the Mongol invasion of Russia ("Bunker Soldiers"). His time in the TARDIS came to an end when, after playing a pivotal role in the sorting out the problems on a seemingly idyllic world he decides to stay behind. It was clear that he didn't seem sure that this was the right decision to make. But in the end he decides to leave the TARDIS to set about reuniting a divided culture and become the leader of a more humane society, finally making the kind of difference he had always desired to accomplish. ("The Savages") (Although it was implied that The Doctor slightly encouraged Steven to leave so that he would be alone when he regenerated, as he was aware that his first body did not have long left to live ("The Man in the Velvet Mask")). During the Game of Rassilon ("The Five Doctors"), Steven was reunited with The Doctor when he was abducted along with prior companion Ian Chesterton, the 'resurrected' Sara Kingdom, Polly Wright and Nyssa ("The Five Companions") and trapped in an alternative Death Zone, where they were caught up in a conflict between the Daleks and the Sontarans. Using his own knowledge from a previous conflict between his world and the Sontarans, Steven was able to instruct his fellow companions on how to defeat the Sontarans by striking the probic vents on the back of their necks before The Doctor was recovered by the Time Lords and the others were returned to their own times. Trapped in a world where nothing at all makes sense Steven along with Dodo find himself forced into playing silly children's games in an attempt to free the TARDIS from the clutches of The Toymaker. Separated from The Doctor and confronted with the Toymaker's clowns and the King and Queen of Hearts he realises the desperate danger they are in even though Dodo sees it all as a game. However, his nonplussed reactions to the games makes The Toymaker even more determined to make Steven and Dodo fail the tasks that he has set before them. The Toymaker therefore makes them even more deadly. In doing so Steven is forced into playing tricks on the King and Queen of Hearts while at the same time he has to watch out for the devious Cyril ("The Celestial Toymaker").